NAHS ACT 30+ Club adds two new members. New Albany High School students who have a composite or subscore of 30 or more on their recent ACT are inducted into the ACT 30+ Club. 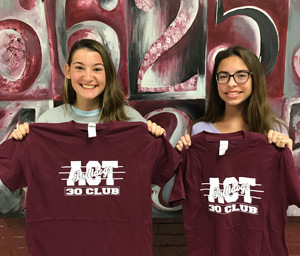 ACT 30+ Club t-shirts were presented to Maggie Jo Everett and Jill Gafford on December 5 for their recent success on the ACT.